For today’s Thrifty Things Friday party, I want to show you not only my fun thrift finds but, to introduce you to the little shop I bought them at. This is kind of a long post. Sorry about that. While at the cabin we had been seeing signs for a big Christmas bazaar happening at a local high school the Saturday after Thanksgiving. We had been looking forward to it but, it closed so early that we didn’t get to go in and look around. However, we had seen signs for an antique and homemade items shop. After driving for a few miles out in the middle of nowhere, we found the shop. This is looking back at the driveway to the road. Some fun things around the shop. I really like using the old silver fork for the hanging the spoon wind chime. I loved this old wine box! I have a feeling I am going to keep thinking about it and wishing I would have bought it. I think it was $25.00. It was a really nice size. The couple that own this shop which, is next to their home, find salvaged items to create new decorative things. The gentleman goes to old factories and odd places like that and digs up all kinds of fun treasures like faucets spigots. And he turns them into hanging racks. I bought a bunch of vintage hankies here (working on a quilt top made of vintage hankies). They have quite a few and they were only $1.00 each. He has also found lots of fun wood cone spool-like things at an old Mill. He cleans them up and refinishes them and adds some color thread. They are only $1.00 each. I bought several of them just for fun decoration in a bowl. He also has some that he has added a pin to the top and some red ribbon to hang. Also only $1.00. I know, I couldn’t seem to take a decent picture all week! He also has this kind of wood doodads that look wonderful in a bowl or could be used as candleholders. Also only $1.00 each! These were awesome as well. These are reclaimed old wood fence posts. He gets them on the lathe and cleans and shapes them and then finishes them off. You can put a candle inside. Each one is unique with the knotholes. And they have a bunch of old burlap bags. All of these large sacks are $10.00 each. He also has some small burlap bags that held shot. They are each $1.00. He makes unusual lamps as well. And they have all these wonderful old wood rolling pins. They are $10.00 a piece. Here is the name of this little shop. East of Kansas is just a small shop with fun things. I love little family owned shops like this! And I try to support them as much as I can. The princess even used her own money to buy a Christmas ornament for her friend, grandma, her uncle and one for us. I talk to the couple and asked if they have an online store but, they don’t. However, I have their phone number and email address for y’all in case you want to buy anything. They will gladly ship to you. I told them that I was going to do this post and they were happy to have me give out this information. These folks are very nice and kind and put up with a “I didn’t get a nap so, I am going to drive everyone around me insane” princess! I know they do not have an unlimited supply of the things I have shown so, give them a call or drop them an email if you want to purchase anything and have it shipped to you! I’m thinking about getting more of these little $1.00 cones. They are just so perfect for a little rustic look and can be used all year long. I am using mine for a bit of rustic Christmas decor. Using my grandma’s wood bowl, some fresh cut Rosemary (OMG, you would not believe how amazing it smells!) branches I just cut and a couple of Dollar Tree Ribbon Candy ornaments. Very simple. I have a giveaway going. It is a special giveaway to send “Cheer” to our military families! I hope you enter and show your support! Just click the picture above to enter! This Saturday is December’s monthly Thrifty Tablescape party! Come and join the fun! Okay, on to the party! Sounds like a great place for a browse - I love those old rolling pins. What an amazingly cool shop! I could spend hours in a place like that. And such clever items. I enjoyed your photos and inspiration. Thanks for hosting. I love finding little places like this -- just goes to show that the artistic ability is not located only in sophisticated metropolitan areas. Imagination is alive and well! What a fun place to shop! Those wooden spool thingies are so neat...they look perfect with your holiday decor..I know that rosemary smells soooo good....I am still gonna have to get me some of that and I still want to try my hand at growing some other herbs too :) Thanks for sharing and hosting...hope you have a wonderful holiday season! Welcome back! Love the tour of the little shop! Thanks for hosing! I LOVE places like that, in the middle of nowhere. Such treasure hides inside. Your arrangement with the rosemary, ribbon candy and cones is unique, festive and perfect for the holidays. I'm just crazy about it. GREAT JOB. You got my curiosity up at Middle of Nowhere too. I wish I had places to look for bits and bobs from abandoned factories and dump sites. Like the others I would spend hours in this place. Thank you for GREAT pictures. Thank you for hosting! What a great little shop you found there. Loving your Christmas decor! 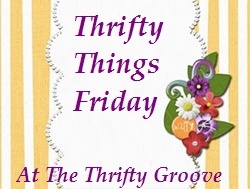 I'd love for you and your readers to join us at Cap Creations every Friday for our thrifty link up! What a darling little shop!! I bet you could have spent all day in there. Great prices. Love how you arranged the spools! Very nice! Thank you for linking up with Home Sweet Home! Diann you are just an awesome lady! Always up to something good! I love the items you purchased and that shop is so cool. Thanks for all the details!